Linen apron is the centerpiece of your kitchen! 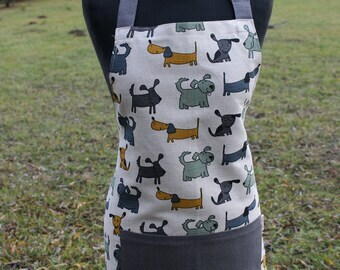 Put on your new apron and you will never want to change it! 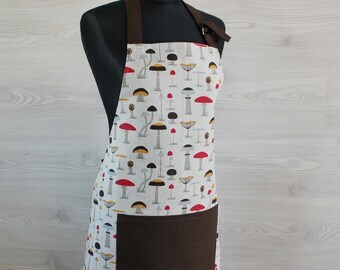 This apron is a wonderful gift for anyone. It is very useful at home and at work, not only for cooking but also for housework, gardening and crafting! Full length apron has a front pocket. We can embroider a name or any other word you want on the pocket. One size for many people! 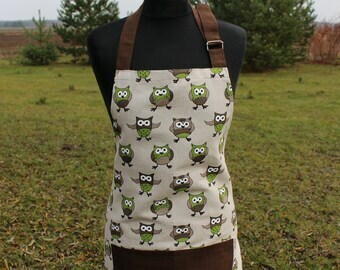 Apron has an adjustable neck strap and waist straps are long enough. 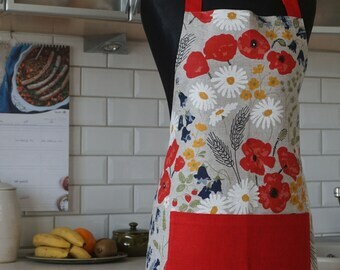 Apron is hand made of 55% linen, 45% cotton. Put personalization information in the comment box at checkout. • Hand wash is preferred, but also a gentle machine wash can be used. • If you wish to use a washing machine, please only use the wool cycle at no more than 30-40°C. • Linen is a natural fiber and can shrink at first wash.
• Hang to dry, do not use the dryer. 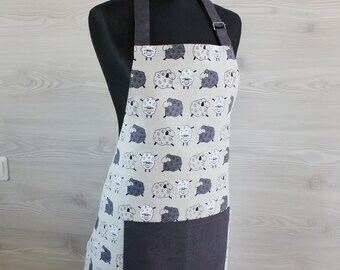 If your liked apron is sold out, please feel free to contact us and if we have the material, we will sew the same you liked. Made in a non smoke and pet free home. Remember that different monitors may show a slight difference in colors. I absolutely love it! Thank you so much! It looks and feels great! Pretty sure my mom will love it! Love the towel! The bright colors pop in my kitchen! The loop is perfect to hang on my cabinet knob. I will absolutely be looking to purchase more. Delivery was fast coming from overseas. Return shipping fee is the responsibility of the customer. I want my buyers to be happy with my items so if there is something you are not happy about for justifiable reasons. You MUST email me immediately if there is a problem so we can deal with it in a way that we both will be happy! If for some reason, you are unhappy with the item you buy, contact me and I will provide you store credit equal to the amount of the item but only after you return the item to me via post and I receive it. The item must be returned within 7 days after you received your purchase. It must also be in its original condition. All items are shipped via via AIR MAIL, PRIORITY with TRACKING NUMBER. International deliveries take up to 2-4 weeks, thus please allow some time to arrive. European delivery times are up to 7 business days. Deliveries to CANADA range from 2 to 12 weeks. I WILL SHIP WORLDWIDE with the Lithuanian post ( www.post.lt). The United States, Russia, Japan, The United Kingdom, Germany, France, Ireland, Denmark, Belgium, Austria, Iceland, Gibraltar, Armenia, Albania, Cyprus, Luxembourg, Malta, Slovenia, Finland, Sweden, Mexico, Paraguay, Kiribati, Aruba, Cayman Islands, Vanuatu, Honduras, The Dominican Republic, and Thailand. At present, shipment tracking events cannot be provided for shipments sent to China and Switzerland. Tracking is also not available in Canada. If you choose EXPRESS shipping, provide your phone number at once during purchase, in the field "note to seller". Currier will call to discuss details about your orders arrival. NOTE: in remote areas shipping could take longer up to 4-5 days. Colors you see on your monitor are not always the same as the real item. It depends on your monitor, so I can't give you a guarantee that your monitor displays the colors in the right way. I prefer to get your feedback when I know your purchase reached you in good condition and our deal is finished. Feel free to contact me here in if you have a wish or request. Yes, I do custom orders. Just drop me a note what do you need and I'll try to make it happen. All custom orders are final sales - no refunds, returns or exchanges once the orders have been submitted.